Rx UV Protectant Cleaner & Polish is Specifically Made for the Protection and Longevity of Today’s Modern Plastics, Polycarbonates, Vinyl Glass, Stainless Steel, Aluminum and Paint. Our Advanced Formula exceeds the standard for protecting plastic, paint and metal surfaces found on Boats, Motorcycles, PWC, ATV’s, UTV’s and all the accessories that go with them. 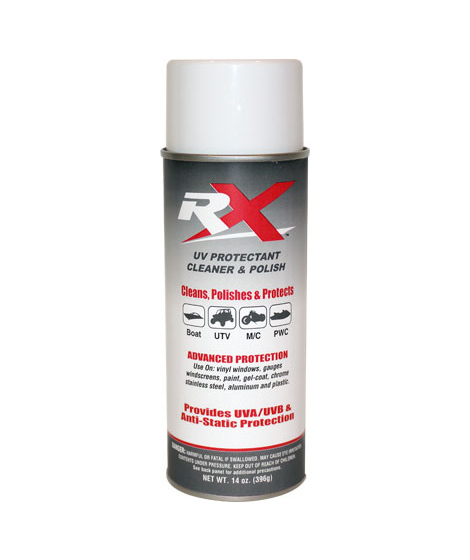 Rx UV Protectant Cleaner & Polish seals the surface with a micro-thin layer of UV protectant. This advanced formula restores nutrients that sun, water and dirt take away. Just one use moisturizes and restores shine quickly and easily. Use Rx UV Protectant Cleaner & Polish to clean and protect any plastic and metal. Just spray and wipe clean. Boaters use Rx UV Protectant Cleaner & Polish on your Isinglass®, Strata Glass®, Lexan®, Perspex®, plastic, stainless steel, aluminum, Gel-Coat or any painted surface. Your vinyl windows will stay cleaner longer from dirt, water spots, salt spray and help prevent damaging UV rays that dry out vinyl windows and ruin them. Regular use on vinyl glass will double your windows life. • Rx UV Protectant Cleaner & Polish Provides 100% UVA and UVB protection. • Rx UV Protectant Cleaner & Polish cleans and protects from dirt, water spots, salt spray and grime. • Use Rx UV Protectant Cleaner & Polish on vinyl glass routinely to preserve clarity and prevent costly repairs. For boaters with vinyl windows this product is a must! Use often and your vinyl glass will stay supple and clear. • For ragtop automobiles and clear bras, use between washings to maintain UV protection and shine and help prevent scratches. • Rx UV Protectant Cleaner & Polish conditions vinyl glass and helps avoid costly repairs from scratches and sun damage. • Rx UV Protectant Cleaner & Polish is an Advanced Formula UV Protectant that is safe to use on gauge lenses, bezels, trim, instruments, hatches and windscreens to protect from oxidation and add shine to your surfaces. • Excellent for Stainless Steel and Aluminum and solid surfaces like granite. Leaves a smooth slick shine that repels water, fingerprints and stains. Makes clean up easier. • Rx UV Protectant Cleaner & Polish has an Anti-Static formula that reduces salt residue, dirt buildup. Contaminates don’t stick as easily and wash away easier with frequent use of RX. • Great for Motorcycle, UTV, PWC plastic paint and bodywork. Gives you that showroom shine. Use on helmets and visors to repel water for better visibility. • For Best results use Micro-Fiber Towels. See our website for great towels! Rx UV Protectant Cleaner & Polish™ is the most price effective solution to other plastic cleaners on the market today. Rx UV Protectant Cleaner & Polish™ is the most advance formulation to date, at 50% the cost of other outdated cleaners! PROP 65 WARNING: This product can expose you to chemicals including 2,2′-iminodiethanol, ethylbenzene, benzene, naphthalene, which is/are known to the State of California to cause cancer, and methanol toluene, benzene, which is/are known to the State of California to cause birth defects or other reproductive harm. For more information go to www.P65Warnings.ca.gov. VOC Information: Product PWMIR=0.18. Applicable California Aerosol Coating Category ( Specialty: Vinyl/Fabric/Leather/Plastic Coating) Reactivity limit=1.45. Conforms to ORMD guidelines. Meets California CARB compliance. Includes one MicroFiber 260 GSM, 16″ x 16″ square towel. Great for vinyl glass, paint and polishing.